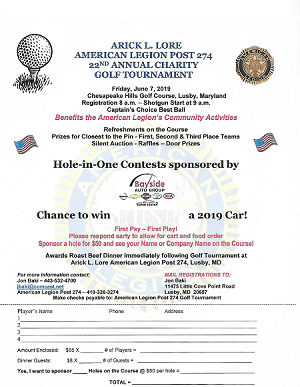 The American Legion Arick L. Lore Post 274 Annual Golf Tournament will be held at Chesapeake Hills Golf Course on Friday, June 7, 2019. This is the 22nd year the golf tournament has been held. 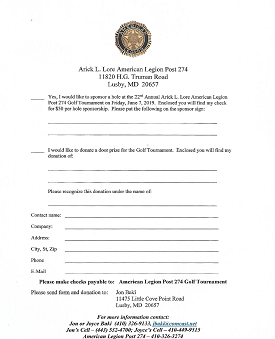 It is one of the major fundraisers done by the American Legion each year. Golf tournament chairperson Jon Baki hopes to raise $10,000 this year to assist the American Legion with programs and outreach for veterans. “All money raised goes directly into projects that Post 274 does each year, “said Baki. “Last year the Post supported the Charlotte Hall Veterans home, Patuxent High School ROTC, local school programs, Boy Scouts, and a host of charitable organizations. And we are very proud to work with the Wounded Warriors, bringing groups of veterans to Solomons to spend the day fishing and then eat what they caught.” The American Legion Post is planning another day on the bay for Wounded Warriors later this year. 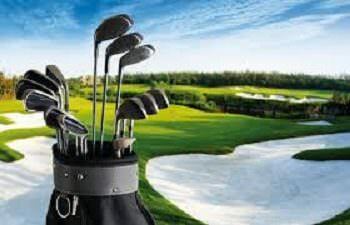 The golf tournament will be held at Chesapeake Hills Golf Course located in Lusby on Friday June 7. Sign-in begins at 8 a.m. with a shotgun start at 9 a.m. The format for the tournament is a captain’s choice best ball. There are refreshments on the course. Prizes include first, second and third place teams, closest to the pin, hole contests and a special prize for the last place team. Immediately following the tournament there is an awards dinner at the American Legion Arick L. Lore Post 274 featuring roast beef, potatoes, green beans and rolls, cooked by the American Legion Ladies Auxiliary Unit 274. A silent auction, raffles and door prizes are also available. The cost is $85 per player and singles are welcome. The fee includes greens fees and cart, the awards dinner, and beverages on the course. For the past ten years the tournament has sold out, so get your registrations in early! Get your name out to the golfers! Sponsor a hole on the course for only $50, and your business name will be showcased on one of the tee boxes. You may also include information in the “goody bag” given to all golfers. For more information on playing or to sponsor a hole, contact Jon Baki at 443-532-4700, or email at jbaki@comcast.net. Please contact Jon early to allow for cart and food orders.